More than a hundred-fifty years ago the Lake Balaton highlands were famous for their red wines, for almost four hundred years this area was the Roman Empire’s most important terroir. 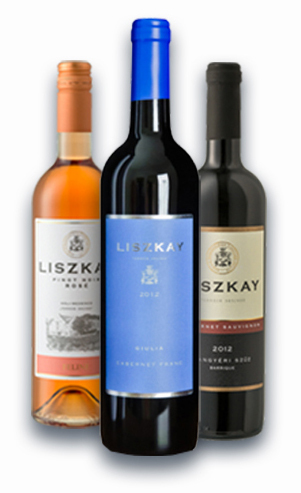 Nostalgia and Michael Liszkay brought back the production of these heavenly red wines to the area blessed by a Mediterranean-like micro-climate offered by the Kali Basin. The volcanic-clay soil of the Pangyer slope, which officially ranks among the highest in Hungary (Terroir 385/400) leaves behind most of the famous Hungarian wine regions (including Szekszárd and Villany) due to its sublime, mineral rich terroir. The Liszkay Winery has a 10-hectare-vineyard, mostly producing red wine. Pinot Gris 0,5 hectare; Pinot Noir 2,5 hectares; Merlot 1,5 hectares; Cabernet Franc 3 hectares; Cabernet Sauvignon 1 hectare. The plantation of the new grape-vine has taken place between 2003-2006 with a row distance of 2,2 meters. Typically after a late harvest a controlled, open fermentation follows and then the wine receives a light, 12-18 month barriquing process. The only white, the Pinot Gris, also after a late harvest, receives a controlled low temperature fermentation. You can taste or purchase our wines at the Estate in Monoszló - during summertime you are welcome at any time, off season please ring us first at +36/70-318-5956 – or in different restaurants and liquor stores. You can find the list of our partners in the site. You can also order them through our web shop included in this site. Check it out, and order now.